Item: Train Bank Name: Birth Date: Font: Please Choose OneNoneInterlocking MonogramCircle MonogramScript Two LineOld EnglishRoman Three Line (Block) Who is this item for? All aboard! Our classic train engine is beautifully crafted and plated with our non-tarnish antique pewter finish. Produced with amazing, detailed artwork, there is room to personalize (optional) the item on the engine car rooftop measuring 1.25" x 2". Overall dimensions of the train bank are 6" long x 3.25" high x 2" wide and the coin slot is located on the roof of the bank. 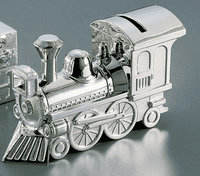 This cute train bank can be engraved with child's first name or initials and date of birth in number format ie. 8/5/79. Makes a great new baby, birthday or any other occasion gift.